The apostolate of Tradition in Lithuania was initially conducted from Warsaw in Poland, by, amongst others, your servant. Belarus and Russia, on the other hand, were served by Fr. Werner Bosiger from the Society’s house in Jaidhof Castle, Austria. I was named to this work in August 2001 and stationed in Warsaw. After Fr. Brucciani was transferred, we would take turns visiting the Baltic States, Lithuania, Latvia and Estonia. My first impression of the Lithuanians was of a people who, though generally poorer than those in Western Europe, have more humility, faith, and respect for the Catholic priesthood. A priest is greeted by the invocation, “Laudetur Jesus Christus” (“May Jesus Christ be praised”) and people kiss the hands of the priests in respect for the sacrament of Catholic priesthood. Nevertheless, materialism is also making rapid progress despite this country’s Catholic faith, and the Church, long the nation’s support under Communism, is becoming less and less “relevant.” Our work consists in the preservation of faith, however, and a crucial point must be remembered: the Lithuanians are a strongly Marian people, and children of Mary are never lost! It is a tactic of Freemasonry and liberalism to import as many foreign elements as possible into Catholic countries with the purpose to disturb or destroy the Catholic Church or even the memory of the Church. Aristotle teaches that an ethnic group cannot absorb more than 5 percent of such foreign elements without losing its culture, religion, and language. In Eastern Europe there are virtually no Moslems, Jews, nor strangers because of the severe poverty and relative isolation of the Iron Curtain for so many decades. 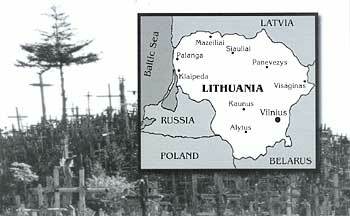 Therefore Lithuania remains itself–Baltic and Catholic. following the celebration of his First Mass in his native country, July 2002. All is covered in snow these past two months, and temperatures drop to -18° F. In winter, -30° F is not unknown! H.E. Bishop Bernard Fellay, Superior General of the Society of Saint Pius X, has decided to erect an autonomous house in Lithuania. Ours will be the first Society priory in what used to be the former Soviet Union. Three priests will be stationed at this priory: Fr. Werner Bosiger (from Switzerland), who will continue to serve our missions in Minsk (Belarus) and Moscow; Fr. Edmundas Naujokaitis, one of the first fruits of our apostolate, a young Lithuanian priest who was ordained in our seminary in Germany on June 29. Deo gratias. (In the interim he will be based in Warsaw. ); and myself, Flemish, from Belgium, ordained in 1995, who will be responsible for setting things up in Lithuania. In the first year of apostolate here we will set up the priory in Kaunas under the authority of Fr. Karl Stehlin who is in Warsaw, Poland. We thank our Blessed Lady for the privilege of being able to work in some way for the distant yet certain accomplishment of the message of Fatima. When Russia converts, it will certainly be to the traditional Faith. at the Offertory during the celebration of his First Mass. We will be responsible for three Mass centers in Lithuania and, in addition, be responsible for Latvia, Belarus, and Russia. In Riga, the capital of Latvia, Fr. Valerij, an Eastern Rite priest, is cooperating with us, while we ourselves minister to about 60 faithful in Minsk and 40 in Moscow. We are also being asked to travel deep into Siberia to minister to scattered Catholics of various ethnic backgrounds. Tertullian says, “The blood of martyrs is the seed of Christians,” and as a result of the Soviet persecutions which made more martyrs than all previous centuries taken together, we surely can expect the greatest fruit–the triumph of the Immaculate Heart of Mary! I have my work cut out for me learning these various languages. Assuredly, it is my first duty. In Lithuania we have a monthly publication called Pulkim ant keliu, sent to almost all the conservative priests in the country. As soon as our permanent base in the country is fully functional, we will publish good Catholic literature in Lithuanian. The people are still avid readers. We have a small team of laypeople who will undertake the production and distribution of these works. It’s another world here–marvellous and poor at the same time. Or, better said, it’s several worlds here! Lithuanian is the language of the Baltic States, one of the most ancient linguistic families in the world and of similar antiquity to Sanskrit, Latin, or Greek. Only two of these languages have survived, the other being Latvian. On the other hand, Byelorussian and Russian are Slavic tongues. I preach by reading from a sheet of paper and hear confessions with a multilingual manual. Vilnius, the Lithuanian capital, is located at the geographical center of Europe. It is a splendid city and I have become acquainted with the magnificent Baltic Gothic style! The story is told of Napoleon who, when passing through the city, seriously thought of transporting, stone by marked stone, its exquisite little church of St. Anne’s to Paris! I prayed before the miraculous icon of Our Lady of Mercy venerated at the city’s Dawn Gate. Thousands of pilgrims come to this national shrine and many finish their journey on their knees. Lithuania is a country with a rich spiritual and artistic heritage, but it is nonetheless hard work trying to re-establish Catholic tradition here. I console myself by the thought that every good work must be marked by the Sign of the Cross. We have faithful in three centers–Vilnius, Kaunas, and Siauliai. Perhaps I should mention Mr. P. in Miroslavas who spends his time assisting us. A former leader of the underground resistance movement during the Soviet occupation, he now travels all over the country trying to convince bishops, priests, and faithful to return to the traditional Mass which was only given up in Lithuania in the 1990’s. He has led a group of like-minded Catholics to collect 2,500 signatures in support of the Latin Mass. A celebration after Fr. 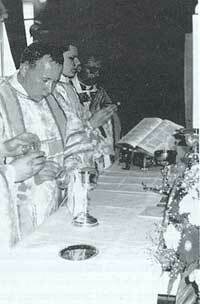 Naujokaitis’s First Mass. God’s grace is doing beautiful work in Lithuania. It is “alleluia time!” (I mean traditional “alleluia,” of course, not that of the charismatics!) We can talk with some bishops, have regular contacts with some priests, and intensive meetings with many faithful, nuns, intellectuals, politicians, journalists, etc. We already convinced some of them, but one by one. It is a spiritual battle of man-to-man, or, better said, soul-to-soul. At the moment we are working on the legal structure for the juridical associations which will be established to act as a platform for our work. Next on the list will be the rent of a building for our priory in Kaunas, at the country’s heart. I am trusting for material support from our friends in other countries. Meanwhile, people visit us daily. Some are convinced, and our numbers rise by two to four every week. There is definite interest in our work and we think about a possible erection of new Mass centers in Panevezys, Alythos, and Klaipeda. There is much to be done in this Land of Mary. Everything is progressing steadily and surely. During the last seven years, I had gathered about 500 pages of the best of documentation. It has become too much to carry around, so I finally asked a friend to scan it into a laptop computer. I’m referring to it nearly every day trying to convince people of good will who are searching for the grace of God. One very important part of my documentation is the videotape produced by the Chartres Committee in the US entitled What We Have Lost. It is a graphic overview of the most important problems and their causes. It’s very convincing. A big thanks to our American friends. One evening this month, a conservative ex-rector of a seminary and now professor, Fr. J.M., said to me that the cardinal of Lithuania–there is only one for the entire country–told his priests that the Society of Saint Pius X was coming and working in this country. He fears that most of his faithful will leave the official church and come to the Society! This sounds fantastic but I fear a little bit of “poetical exaggeration.” For me this means that he knows very well that most faithful and people in Lithuania are very conservative and hate this modernism. We have been approached by a little congregation of Sisters, founded in 1998 by Cardinal Vincentas Sladkevicius of Vilnius, former Archbishop Emeritus of Kaunas. Before he died on May 28, 2000, he left orders with the Sisters: “When the Society of Saint Pius X comes, you must join them. They will restore the Church in Lithuania.” May God with His grace enable us to live up to the Archbishop’s expectations! Cardinal Sladkevicius said that the Society will be principal to the revival of the Catholic Church in Lithuania. Wow! I hope he is a prophet! Thank you, Cardinal: we will pray for your beautiful soul. He founded this new congregation for Sr. Wanda and her sisters. They’ve waited several years for our arrival, living alone in separate houses for lack of financial means for a common house. I want to receive these Sisters as generously as possible. Sr. Wanda and her friend, Miss V., visited this month. They are convinced about the necessity of our work and promised to clean our priory regularly–helping, praying…so that they can assist piously at the Mass and devotions. They want to eventually become oblate nuns in our Society. We are working to educate the other sisters. Deo gratias. Fr. Karl Stehlin and Fr. 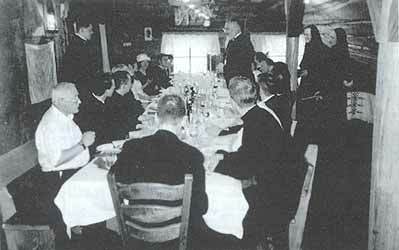 Edmundus Naujokaitis teach in a barnyard. Thanks for helping us conquer this country for Christ, a country that was once part of the awful Soviet Union. Thanks for your prayers. Prayers are certainly more important than our action, computers, and all human means. Both prayer and action are necessary, of course, but the logic of grace will surely conquer. Traditional faithful (and even conservative “Conciliar” faithful) the world over pray for the conversion of the former Soviet Union as was asked in the Fatima Message, that is, the First Saturday devotion. With prayer, it is “normal” that the good God would be working something! We only hope to be excellent instruments in His hands. Two more appointments! I will meet a priest and a nun to speak about Tradition. Until now I have not had one single clearly negative reaction. Things progress slowly because Slavonic and Baltic people are of a melancholic temperament, but certainly forwards. The juridical basis of our foundation is proceeding. Then, we are going to rent a house in Kaunas as a priory. Two other priests will come. In the meantime we are doing what we can contacting souls; later it will be full speed. Well, not totally “full speed,” because I’ll be needing a while to learn this 4,000-year-old Baltic language, one of the eldest and perhaps most difficult in the world. We are doing what we must and God will do the rest. I always thought that Lithuania had the best chance of the nations of Eastern Europe for Tradition. It is a very special country, as you already know. I personally visited it many times about 10-12 years ago. The Catholics are very pious and devoted to Mary in Lithuania and that is why they don’t want this modernism. I heard from a Carmelite nun in Lithuania that the nuntius tried to suppress devotion to Mary. The people pleaded to the Pope. So now, Rome is still suppressing, but is doing it more slowly. My other point is supernatural. The future success of the apostolate of the Society of Saint Pius X in Lithuania might be similar to what occurred in the Philippines. The apostolate there needed a death, or, I would rather say, the entrance into heaven of Bishop Salvador Lazo and his prayers from up there. In Lithuania, there was a death of Cardinal Sladkevicius in 2000 whom I personally met ten years ago. It is not incidental that you will have the priory in Kaunas: he is buried in the cathedral there! He is the patron of your mission in Lithuania! Pray to him and you will have many conversions. Did you know there was a young bishop of Lithuania who made the Pilgrimage to Chartres, with the “indultists,” and celebrated the Tridentine Mass there? Answer: Yes, we know him and we are going to visit him–Bishop Bartulis of Siauliai. I want to tell you a story to show you once again the interest people have in us. Last week, I went by bus from Vilnius to Warsaw; today I returned by bus from Warsaw to Vilnius. The trip is ten hours long each way. I met some persons who were interested in me because of my cassock. I began to speak and finally, because I had my laptop with me, I showed them a part of my documentation about the crisis, including the film What We Have Lost. They were very interested. (A female medical student watched my screen until the battery died.) They asked my address and phone number. They were convinced of the crisis and of the necessity of Tradition. They promised to stay in contact. Unlike most I meet, these people understood English. Why so much interest here? I think for the following reasons: 1) there is much of the Faith remaining here because of the isolation of the former Iron Curtain kept liberalism from penetrating quickly; 2) in the face of the modernist, charismatic, liberal, and progressive disinformation, people were wanting the truth; 3) the blood of the martyrs of Communism cries to heaven. Corrupt and intrinsically perverse Communism is responsible for the death of hundreds of millions of people and martyrs. The 20th century has made more martyrs than all centuries before. Most have been forgotten, however, and we should resurrect their memories in order to honor them. A priest from Lvov told me between 30-40 million Ukrainians were deported by the Communists to Siberia to die! I hope he is making a mistake, though I fear he is not. In any case, the historical fact is that in the western Soviet Union several million were killed or deported. We had a long talk with a student friend of R.’s named V. He was strongly impressed by our documentation and became totally convinced of our positions. I was quite happy to have been able to answer all his questions and prove it by showing, pictures, documents, newspapers, declarations, videos, etc. He said he was going to think everything over during the next few days. The day before V.’s visit, we met with R., a young man who wishes to go to our seminary in Zaitzkofen. He will plan to spend a year in our priory in Warsaw as a pre-seminary because he has to learn German first. This month, I signed the contract for renting the priory house in Kaunas. The priory is located in the center of this city of 500,000 inhabitants and near three universities. We celebrated the first Sunday Mass in the new priory. Deo gratias. Fr. Franz Schmidberger arrived for a few days to visit and offer advice on the conduct of the apostolate. We visited together a priest in Kaunas, Fr. B., who was a venerable leader of the underground Church during the years of Communism and now head chaplain of the army. He was very glad to become acquainted with us and will try to learn to celebrate the Latin Mass. He will get us in contact with other conservative priests who are persecuted by the bishops here. For instance, 20 priests have refused to celebrate the Novus Or do Mass on the “table.” In response, the bishops have forbidden them to celebrate Mass in public. Perhaps the greatest target for which to aim is to discover the country’s heroes in the battle against Communism and encourage them to fight again with the same courage–perhaps more!–against liberalism and modernism. These are more dangerous and pernicious than Communism. When we manage to convince them, we will be engaged in a real battle of present-day “Maccabees” against liberalism. We visited Siauliai this month. There were nine faithful. Six of them were enrolled in the Brown Scapular of Our Lady of Mt. Carmel and three new people saw and heard the documentation conference for the first time. A priest stationed in the north of Lithuania contacted us, saying he wanted to join the Society of Saint Pius X. I will visit him next week. R. told me he wants to go to the seminary. Deo gratias. I met with Mr. U., president of the most Catholic political party in the country, to discuss the traditional social doctrine of the Church, of which he was very much in favor. He told me he has contacts with some bishops. Apparently, the Lithuanian Bishops’ Conference has complained that Lithuanian Catholics have not accepted well the Vatican II renewal. Deo gratias. We met with Mr. S., head editor of the biggest Catholic newspaper in Lithuania, appearing twice a week. He is in conflict with his modernist bishop and recommends the Society publish in his paper. I met with Bishop J., a sympathetic, conservative prelate from the circles of Bishop Sladkevicius. He has sent R. to us and recommended him for a priestly vocation. Bishop J. accepted all my explanations about Tradition. Happy day, and what Eastern hospitality! I had a meeting with Fr. V. in the north of the country. I answered all his questions and gave explanations about the crisis in the Church. I will have to return frequently to visit him because he wants to become a member of the Society of Saint Pius X. I have to teach him the Holy Mass of Pius V. I offered him an altar missal. He said he was ordained as is now custom in the country, that is, in the old rite but in the Lithuanian language. This is advantageous because these ordinations are certainly valid. This day was important, blessed. How could it be otherwise?! It is the feast of St. Josaphat, who was archimandrite in Vilnius. I also learned from Fr. V. that this 2002 is 400th anniversary of St. Casimir, patron of Lithuania. Now I understand how these graces are coming to us to launch our apostolate here! And, what do you think is the name of our priory in Kaunas?–Priory of St. Casimir! On the 17th of the month, before the beginning of Mass at Kaunas, a young man named Anthony asked me if he could become a brother in the Society. He has been only one of several who have been interested in pursuing or safeguarding their religious vocations with us. I hope and I pray that we will be able to accept all these possible vocations, with paternity, solid doctrine, and formation in piety. Within the last three months, we have had such requests from a parish priest from the north country and another from Kaunas, two pre-seminarians, a possible brother, two female oblates, and a layperson who wishes to become a member of the Third Order of the Society of Saint Pius X. Deo gratias. Thank you for your prayers. According to the Gospel, vocations are the divine gifts bestowed in return for prayers. Some happy news came to us at the end of the month. Mrs. R. came to the Mass in Kaunas and told me she is correspondent with the newspaper. She wanted an interview with me and made an appointment for next Monday. (I wasn’t able to meet with her right away, because I was to meet this week with three more priests–two in Lithuania, and Fr. S. in Riga, Letland.) After Mass in Kaunas, two persons–an elderly woman and a young man–saw the documentation about Assisi. They responded that such an event as Assisi was “impossible,” and that we were absolutely right. Fr. B. wants to collaborate closer with us. I believe Mrs. R.’s suggestion to have Fr. B. hear confessions in our chapel in Kaunas might be good. The people like to confess in their native tongue and I am still far from being an expert! Fr. P. asked if it was possible for him to join the Society. My visit to Fr. S. was as always very, very happy and of a great hospitality. He has found a German benefactor to underwrite the building of a priory and church for our Society in Riga, where the Latin and the Greek Uniate Rites can be celebrated in two different levels. He has three sisters of the Theodorite and Studite rule who will live in this spiritual center. Deo gratias. Bad news! The intensity of the apostolate is wasting my stomach. I have to take measures to stop this “massacre” or the mission will be minus a priest. Please, may I ask a little prayer to find somebody who can cook for me at Vilnius? Deo gratias. Early this month, a newcomer, Miss S. from Kaunas, was shown What We Have Lost. She is a teacher and now she wants to show the film to her class. Excellent news! I had written that our best target in this apostolate would be the nation’s anti-Communist heroes whom we could convince to take up the more courageous battle against Liberalism. Well, that’s exactly what’s developing….We met with Fr. A. who had a very high position in the Church hierarchy, but was moved away after the death of Bishop Sladkevicius. He is now organizing among 20 priests a strong reaction against modernism and corruption in the post-Conciliar Church. He says as much as 40 percent of the Lithuanian clergy is sympathetic because it is rather conservative.They want to collaborate closer with the Society of Saint Pius X and propose it as an alternative for the modernist corruption. Some of them even want to become members of the Society. I returned to “headquarters” in Warsaw. The rule obliges me to return here every other week in order to pray in common with my brother priests. The first thing I will do when I return to Lithuania is baptize an adult. Deo gratias. Within this month is the great feast of Our Lady. Our Lady, Gate of the Dawn (in Vilnius), Mother of Divine Mercy, pray for us, be the Gate of the rising Sun, Our Lord Jesus Christ, who must return in His Divine Mercy because He has been uncrowned for we cannot live without Him. Let the Baltic States be the Gate of the realization of your promise in Fatima, the Gate of the conversion of Russia as it was always in the past. Here she is doing something!…It is very, very strange that in this apostolate, for the first time in my life, I am experiencing something I never saw or heard before, that is, in two years time, I’ve not had one single really negative reaction. All the people whom I’ve met have understood two things–that there is a real problem in the Church, and that our reaction to it is good common sense. I don’t understand how it is possible, but it is a fact. What a difference with Western Europe where we are treated as extremists, fascists, racists, fundamentalists, excommunicated, schismatics, integrists, extremists, dinosaurs, marginals, etc…We are fortunate that it is a beatitude to be calumniated! It is true that we have now real possibilities in Russia. However, Prime Minister Putin has been searching for unifying elements after the collapse of the Soviet Union which resulted in many states becoming independent. One of the most important unifying elements is the Orthodox Church because membership amongst the entire population is officially 70 percent. Putin no doubt is aware of the political principles, “The friends of my friends are my friends also” and “The enemies of my friends are my enemies.” The Orthodox Church has its reasons to fear the Catholic Church. Therefore, the Catholic Church has difficulty surviving in the Russian federation. One of the reasons for the fear of the Orthodox is the historical fact that many Catholic vocations entered Orthodox seminaries during the Soviet persecutions because the Orthodox Church offered sanctuary and more possibilities than the Catholic seminaries. 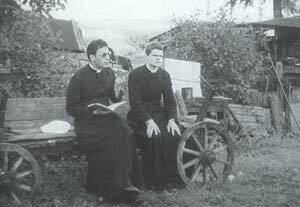 Those that did remained Catholic in their heart, though they did not want to enter the Catholic seminaries. The Orthodox leaders are aware of this. That’s why the Balamand Statement had to come as quickly as possible! Another reason for fear of the Orthodox is the sensibility of the Slavic people that according to Pope St. Pius X himself, Russia will be converted by the Eastern Rite (the Uniates), not the Latin. The Orthodox Church has always tried to divide the Catholic Church by boycotting the Uniates and favouring the Latins. That’s why the Society priests are welcome here. We are Latins and, therefore, not perceived as dangerous. The Orthodox even perceive us as a “disturbance” within the Latin Catholic Church. And, because we oppose ecumenism, the “faithful” Orthodox perceive us to be like them. I foresee that within two years, we will have the possibility of even renting a little church in the center of Moscow itself! I called Fr. Bosiger. He said he celebrated for the first time in years a Holy Mass on Sunday in Moscow. This past Sunday was December 8th! At mid-month, we went to the west of the country to meet a contact person, Miss V.S., for the groups in Kretinga and Klaipeda that were interested in the Society some years ago. Until now, no priest was available to go and and meet these groups. Miss V.S. accepted us with generous Eastern hospitality but told us she was tired of fighting, wanted peace, that this Pope was finally a good one, and would not be available to organize further contacts for us. I think she was feeling this way because her group managed to have the local bishop move a modernist Franciscan convent in Klaipeda to Vilnius. She was somewhat satisfied with her little victory, I think. We showed to her and two others What We Have Lost and a Russian film about the freedom of religion policy of the Vatican. Tears welled in her eyes and when she saw the fat Buddha upon the altar tabernacle in Assisi, saw the Pope receiving the Hindu tilac in India, etc., she reversed her decision and told us she would contact people, organize conferences for us, etc. She’s back “putting war paint on her face!” I remember practical psychology taught us that red-haired persons have much of the “irascibile” appetite in them, a penchant for strength to overcome obstacles. Such is Miss V.S. We need more persons like that. Mr. U: After we gained our independence from the Soviet Union, there was an invasion of liberal ideas that destroys morality. Fr.J. : We know in the West that the mass media are in the hands of liberals. It is the first thing they wish to control in a country. With the media they can influence public opinion to go for installing democracy that becomes rather “demon-cracy.” They get the votes and the power to install liberal laws. Our Lord is uncrowned. They can quietly install their Novus Ordo Saeculorum. Mr.U. : Young people are particularly influenced by those new ideas. Mr. U.: The powers that promote liberalism have a lot of money. We see that the Church no longer gives a strong, clear testimony of the Faith which the people need in this confusion. Mr. U.: We see the hierarchy collaborating with the government about principles against the Faith–for example, euthanasia is accepted–but the hierarchy has the gall to complain that the faithful do not follow! ? Fr.J. : Yes, I have heard that the national character of Lithuania is very conservative. Mr. U.: A certain number of priests are resisting and want to organize a restoration. Fr.J. : The Society of Saint Pius X is here to help, advise, and confirm them. They are certainly persecuted, humiliated, and rejected by the modernist clergy! Mr. U.: Exactly! You can also give conferences at my political gatherings….By the way, I found two microphones in the apartment hidden behind the ceiling lamps. They’re certainly from Soviet times. A Lithuanian representative for the United Nations lived here, followed by another from the KGB. Fr.J. : How do Communists work to propagandize Catholic priests? The Society is in Belarus. It is still Communist. Mr. U.: They send you a “large-hearted” man who tries to win your confidence and friendship. He will try to convince you to work for them. If you refuse, you will be observed more carefully in order that your weakest point can be identified. Then, propositions will be madeto you according to your weakness, if it be money, career, women, power, etc. Fr.J. : That’s what the devil is doing, too! Mr. U.: I would say it’s wise to change the priests from time to time. You get the idea. 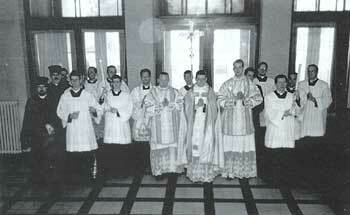 Please pray for us priests. We are like lambs among the professional wolves. For weeks, it has been -40° F. I’ve never seen or felt anything like this in all my life. The fields were wonderfully white, a real fairytale decor. The ice was absolutely everywhere–upon each plant, tree, in every detail of each object. When one spoke outside, there were crystals dancing in the air. The good God is a Great Artist! In any case, I had to smear fat on my face, otherwise it would freeze. It is the custom here. The meeting with the bishop of Siauliai was not too bad. I will give him some books about Catholic Tradition about the crisis in Lithuania. A priest friend, Fr. A.B., who knows the techniques of the Soviets because he was a member of the glorious underground Church, will sweep our Mass-center apartment in Vilnius and our priory in Kaunas for other microphones and radioactive materials which would harm or kill us. He “bought” the radioactivity meter from a Soviet officer for two bottles of Lithuanian vodka. (By the way, I learned recently that vodka is “currency.” In the West, time is money: in the East, vodka is money! That’s the difference in mentalities!) Fr. A.B. was almost poisoned to death himself ten years ago by a radioactive material in an aluminium powder hidden in his car. The same powder was hidden around the altars of other priests…in their chair, clothes, etc. Fr. A.B. told me that a “very dear faithful” gave him some tasty-looking food one day. As a matter of policy, he refused to eat it and, under heavy protest from his sister, he gave it to his dog to eat. After two days the dog went blind, and the day after, he died!….What a country! Fr. A.B. says the bishops and/or the State are still capable of doing the same today. Tu autem Domine miserere nobis. Mr U. told us that new technology allows microphones to be hidden in a sheet of paper! It’s nearly impossible to find. We will have to learn to speak with our hands, perhaps?! Fr. A.B. said also that the bishop of Kaunas is now proposing to the Bishops’ Conference to allow the celebration of the Novus Ordo in Latin in a Catholic church of every important town in Lithuania. It will certainly keep some people from coming to the Society of Saint Pius X. Once again, it means the bishops are afraid of us, of losing people to us. An advantage of this is it will slow the speed of modernization in the country and give us the time to better organize our apostolate. Fewer people, however, will understand our combat. Permission has been granted for us to give a conference at Vilnius University with open admission to the public. I will certainly show What We Have Lost. We received the request of a sixth candidate for the priesthood. He wants to become a Dominican. You see, everything is going good. If we are killed, as was the fate of priests in the old Soviet empire, we will be counted the first martyrs of the Society of Saint Pius X and win for ourselves what is certainly not an uncomfortable situation in eternity. Next week we are trying to move to the priory in Kaunas. A funny story: I tried to vacuum the apartment in Vilnius. I put the plug in the socket and switched on the vacuum. The vacuum did not start…but the light in the room went on! The owner of the apartment told me not to try to figure it out nor to repair it. It’s the old Soviet system. I’ve begun to understand why the “Soviet system” was totally bankrupt. The people were terrorized and damaged by a century of perverse Communism, and further undermined by severe alcoholism when many tried to forget this Communism by drinking. I had another meeting with Mr. U. He told me that many older priests are refusing the young priests who are coming out of the seminaries with bad, modern formations. These elderly priests have contacts with each other, support each other. We will have to visit them, confirm them in the Faith, and encourage them in the battle. We found the package I’d been expecting for two months. The post office was going to send it back because it didn’t know we were renting the house. This would be an unbelievable situation for a western mind, but in the east, anything is possible. In fact, the post office was ready to send all my mail back–from Belgium, France, England, Switzerland, the States–without ever checking if somebody with my name lived at this mailing address. Twice I told them I was living here! I’ve learned the best response is not to try to understand, just accept their mentality. Try to live with it without getting nervous or angry. We cannot change everybody here at once. Stress does not exist and organization is something rare. “Timing” is something no one understands. Maybe that’s the reason there are few heart attacks. That is an advantage! The more one becomes familiar with the former Soviet Union, the more one is confronted with this mentality… But I also found out that there are still four more packages waiting for me at the post office! We are going to try to get them this week! Prior of the new St. Casimir Priory of Kaunas, Lithuania, working for the Society of Saint Pius X’s apostolate in Lithuania, Latvia, Belarus, and Russia. This entry was posted in Actualities, Solution to the crisis by Julien Laurent. Bookmark the permalink.